Buddhism Schools - What are the different schools of Buddhist tradition? Additionally, there is Vajrayana Buddhism ("The Diamond Way" or "The Thunderbolt Way", sometimes known as "Tantric Buddhism" or "Esoteric Buddhism"). Some people classify Vajrayana Buddhism as part of the Mahayana school, whereas others consider it to a separate third schoo. 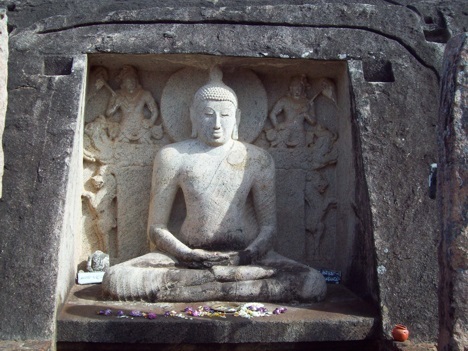 Both schools accept Buddha as their teacher. Both schools accept that both members of the laity and the sangha (monastic communities) can puruse the path towards enlightenment (bodhi). Both schools consider buddhahood as the highest possible attainment. Both schools accept the four noble truths (the truth of suffering (dukkha), the truth of the origin of dukkha, the truth of the cessation of dukkha, and the truth of the path leading the cessation of dukkha). Both schools accept the noble eightfold path (the eight elements of the path leading to the cessation of dukkha - sometimes represented by the eight-spoked dharma wheel (dharmachakra)). Both schools accept the three marks of existence (the three marks of existence shared by all sentient beings - impermanence (anicca), suffering (dukkha), and non-self (anatta).